God is faithful! We are so thankful for his handiwork in our midst here in Port Orchard. At our annual elders retreat at Ocean Shores we laid the plans for updating our facility. Through the good stewardship of our congregation we had the money saved up for the projects proposed. We consulted with an architect about some future expansion and remodeling of our facility. Before any building we knew we must first update our existing structure. Our church, like many of yours, had been built in stages. The stages were completed in different times and the entire structure was in desperate need of a remodel. • With the design help of several of our young mothers, we remodeled the nursery, tearing out some walls and updating the colors, flooring and technology in the space. It has been very well received by our young families. 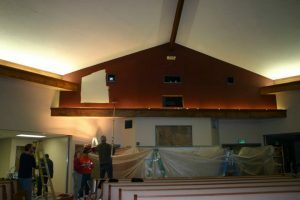 • Then we began painting the sanctuary, foyer, fellowship hall and hallways. We had about 30 different people sign up in several teams to come on week nights and some Saturdays and completed the work in only two weeks. • Now we are ordering flooring for the sanctuary, foyer and all of the upstairs Christian Education facilities. We will be replacing the old dated pews with 300 new chairs. These chairs have been purchased and awaiting their installation. The building already feels refreshed and renewed. We are so thankful for the sacrifice of our church families and the provision of the Lord in these updates. We are very excited to be having Adam Renberg come and intern with us for the months of June through December. Adam’s family has a long and blessed ministry heritage in the North West. His grandparents Bob and Ruth Renberg, began the Alpine Boys ranch in the mountains here and helped hundreds of troubled boys find spiritual guidance and repaired lives. His father and mother Rob and Amy Renberg began their pastoral ministry at Northwest Bible Church in Enumclaw, Washington. Adam comes with many gifts and excellent recommendations from the college. We are looking forward to giving him opportunities to minister in all things pastoral. We know he will be a blessing to our congregation. Exciting Christian Community has been a passion of mine all of the years of my ministry. Arriving at GBC Port Orchard, the elders and I developed our ministry vision of Building People. Using Ephesians 4 we determined that we would be a church that was about building people in their relationship with God, in their relationships with others in the church and in their community as they serve others. We have since expanded our Sunday morning adult classes, Adult Bible Fellowship, from one class to four. This has multiplied our teacher base, giving others opportunities to grow and develop in their spiritual lives as they teach, and provided 4 different age groups to which families can fit and live out their faith together with others going through their same life experiences. These classes have developed over the past two years and we are now at the place of beginning Home Fellowships from these classes to further disciple and Build People in our church into mature believers. In early May, two couples met at our home to begin the training and laying the ground work for two Home fellowships that will begin in the fall. It has been a long time coming but I am excited about what God has already done and look forward to seeing how he uses these groups to encourage the connections and growth of our members.